“Wake” by John Walker, one of 32 artists with work in “You Can’t Get There From Here” in Portland, Maine. PORTLAND, Maine — The 2015 Portland Biennial is — typically for this exhibition, which is now in its ninth incarnation — tightly organized and aesthetically rewarding. Put together by Alison Ferris, curator of the John Michael Kohler Arts Center in Sheboygan, Wis., it features the work of 32 artists, and is on show until Jan. 3. “You Can’t Get There From Here: The 2015 Portland Museum of Art Biennial” is a conservative sort of show: lots of painting and sculpture, in familiar figurative or abstract idioms. But it’s high-caliber stuff, and the mix of artists and mediums feels fresh. To be eligible for selection, all the artists must have a “meaningful connection” with Maine — a broad criterion that no doubt suits the peripatetic habits of so many artists who love to work in the state. Some, such as Lois Dodd and John Walker, have national and even international reputations. 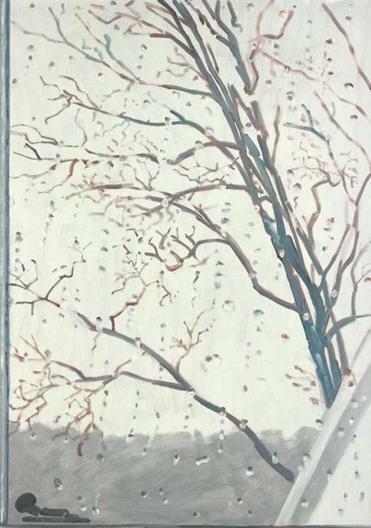 Dodd’s six small paintings, showing a dying amaryllis, a tree, and a wintry view out a snow-flecked window, are austere, honest, and deeply absorbing. What a wonderful painter she is! Walker’s much larger painting shows him in a rich vein of form. This widely admired but often underrated artist retired this year from a long and fruitful period directing the graduate MFA painting program at Boston University. Walker’s latest works, which draw on hours spent painting outside his studio on the coast of Maine, are as fresh and vital as anything he has done. 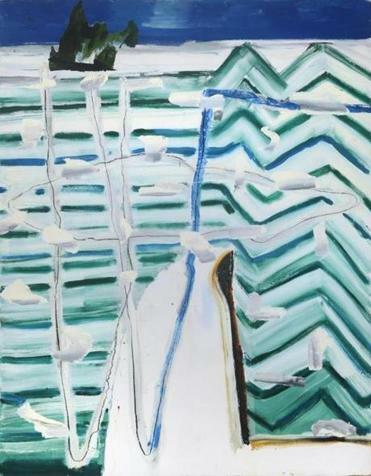 The work here, at once taut in its composition and unfussy in its application of paint, evokes a spit of land, a thin strip of deep blue sky, and waves schematized into jagged blue, green, and white stripes. Despite the fact that it is the work of a man in his mid 70s, it is juiced-up and startlingly contemporary. Another highlight of the show is Anna Hepler’s marvelous “Reveille,” a huge woven metal sculpture suspended from the ceiling with trumpet-shaped openings at either end. Calling to mind giant flowers, fish traps by Australian Aboriginal artists, or a transparent version of Anish Kapoor’s giant “Marsyas” sculpture — the first work to fill the Turbine Hall at London’s Tate Modern — it is placed so that one end hovers over the head of the viewer while the other, at 90 degrees to the first, opens out onto the first-floor balcony above. Standing below one billowing aperture, your body perceives an almost magnetic force pulling from above. The tension between the splayed-open trumpet forms at either end and the slender, cylindrical body of the piece is captivating. Hepler’s work connects, in size, material, form, and floral associations, with the two nearby Bisbee sculptures, and with the remarkable woven baskets by four of Maine’s celebrated Wabanaki Indian basketweavers: Theresa Secord, Jeremy Frey, George Neptune, and Sarah Sockbeson. These works, often brightly colored (Frey’s more demure pieces are an exception), are based in sophisticated craft traditions, but they boast fanciful embellishments (none more so than Neptune’s), and have an inventive, freewheeling quality that is instantly endearing. Hepler’s immersive “Reveille,” which forces you to gaze up into it from below, also invites unexpected comparison with Owen Smith, who has placed four TV screens, suspended from the ceiling, just inches from the floor, facing down. To see what’s on the screens, you must lie down on your back on comfortable mats and wriggle your head up under them. What you see from this supine position is footage of the sky, with shifting clouds and the occasional passing bird. Smith’s gambit is loaded with ironic reversals. For most of us, the point of lying on one’s back to look up at the clouds is to leave the constraints of indoors and digital screens behind — to get a dose of the real and a sense of our proper place within it. But how often do any of us do it? And how much would we want to in winter? Smith’s piece — the equivalent, I suppose, of those looped videos of burning-log fires that offer no actual warmth — is not to be taken too seriously as art. But its wit is sharp, and it is surprisingly pleasurable, at the end of the show, to lie down and gaze up at those clouds. I didn’t know quite what to make of Richard Van Buren’s splintered, kitschy sculptures in lurid colors made from resin with glitter, pigment, and shells, including mother-of-pearl. But they are ambitious and visually compelling, and like Emilie Stark-Menneg’s wild concoction featuring bathtubs (full-size and in miniature), a sculpted pig’s head, various paintings, a TV screen showing a video, a garland of fake ivy, a listening station with conch shells, and much more besides, you can’t ignore them. Both artists contribute a welcome anarchic quality to a show that otherwise tends toward sobriety. 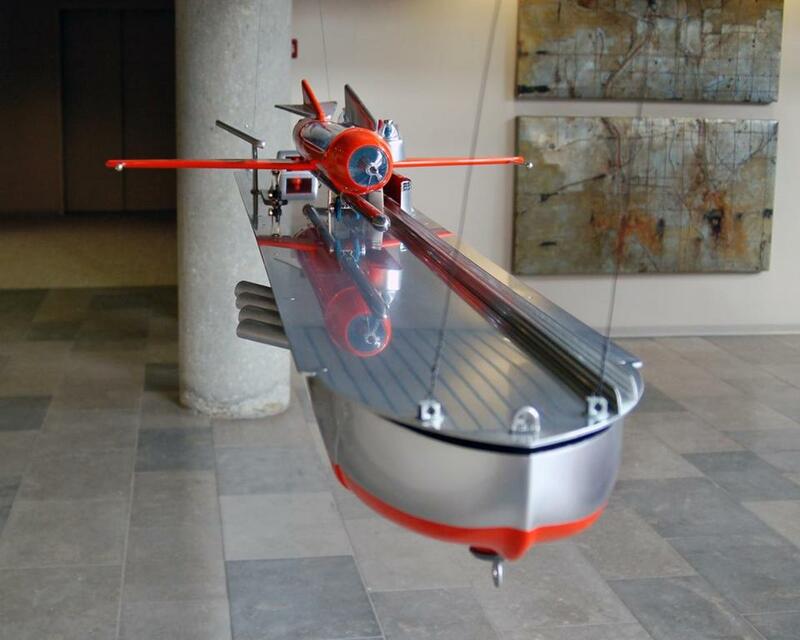 Among the other highlights are a suspended retro-futuristic space rocket designed to drive away sadness by Randy Regier, a series of sleek and suggestive sculptures made from ceramic, urethane, and lacquer by Miles Spadone, and a nearby set of sculptures inspired by traditional Japanese “minka” architecture by Bradley Borthwick. Twelve black-and-white ambrotype photographs of bridges, waterways, and trees by Michael Kolster make for a very absorbing display in a darkened side gallery. And both George Mason’s exquisitely colored and textured abstract painting, made from plaster, burlap, casein paint, and encaustic, and Meghan Brady’s series of three more colorful abstracts, making great play with translucency and space, are beautiful. Often, group shows and biennials — even those with a single curator in charge — feel stitched together by a warring committee of good intentions. The Portland Museum of Art Biennial is a cut above. It’s an excellent show.